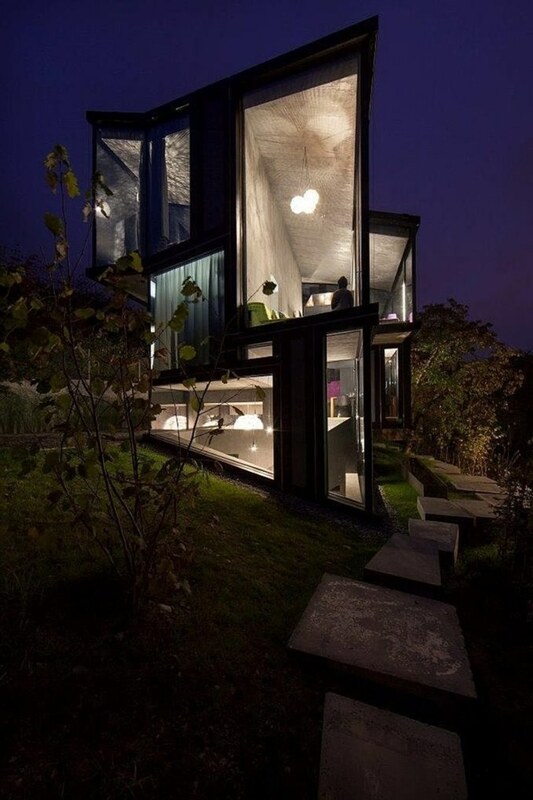 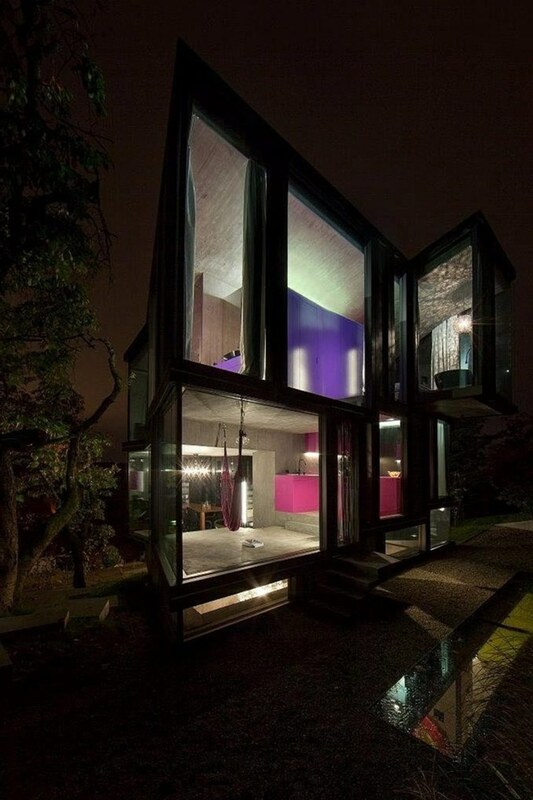 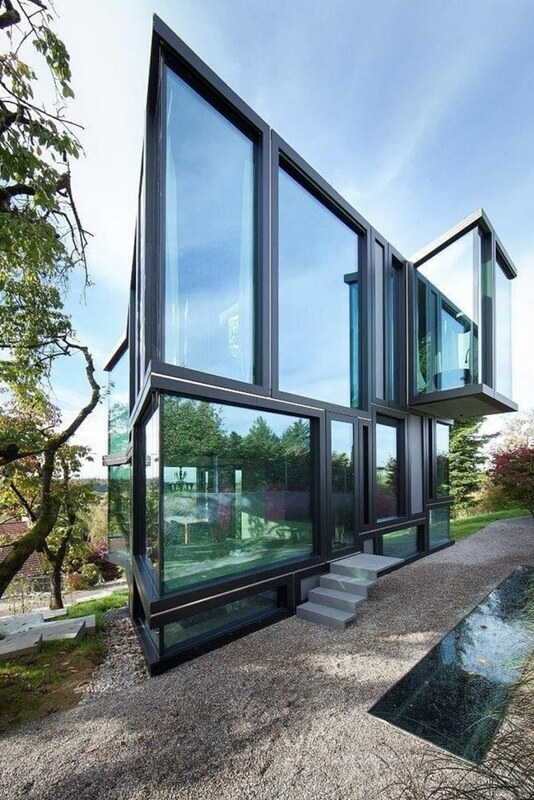 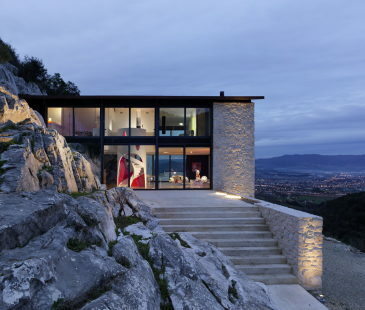 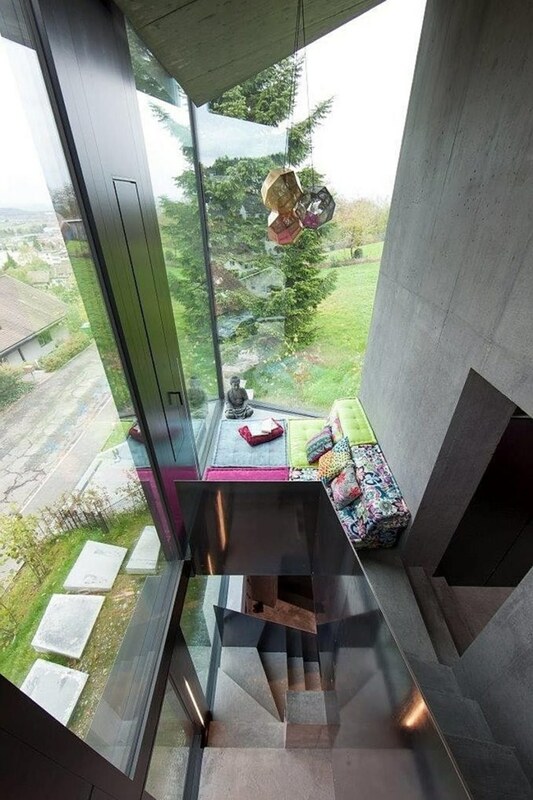 A two-story residential house of glass and concrete declares its originality to everyone from distance who notices it by chance on the horizon. 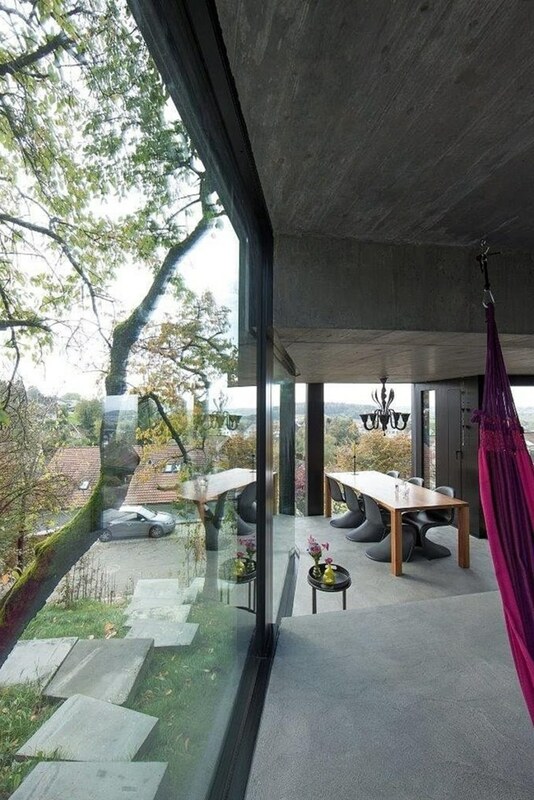 An unusual architecture and unique design is an open challenge to routine and monotony, that can be often found in suburban villages. 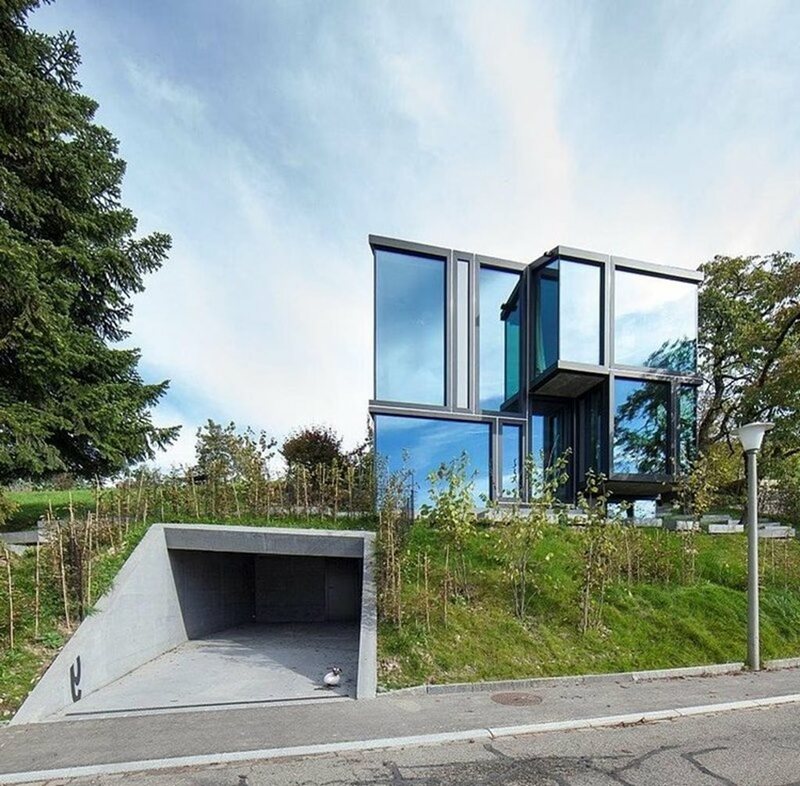 In this house there are two residential floors and a spacious underground space, equipped for a garage and a wine cellar. 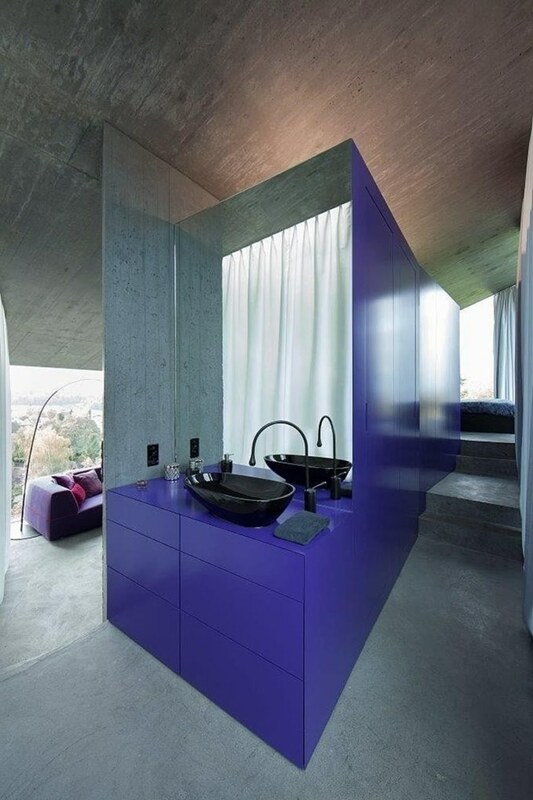 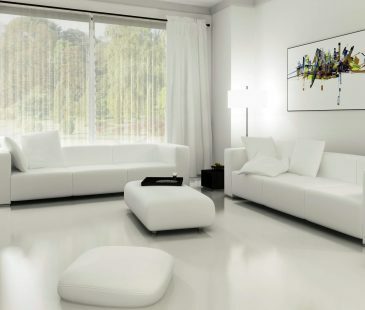 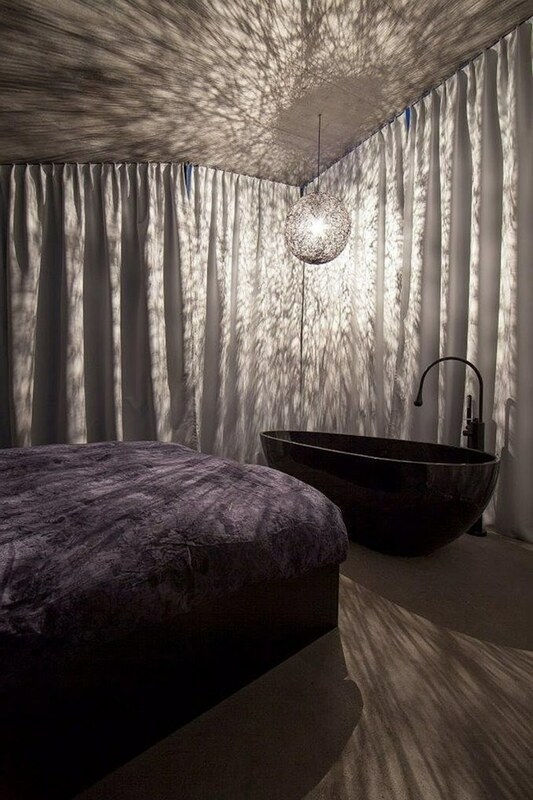 Mirrored walls transmit maximum sunlight and warm in the rooms, allowing to save lighting and heating. 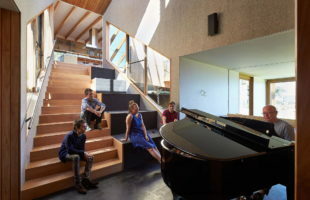 The first floor in this amazing house is designed in several levels that visually divides the space into functional zones: a living room, a kitchen, a dining room. 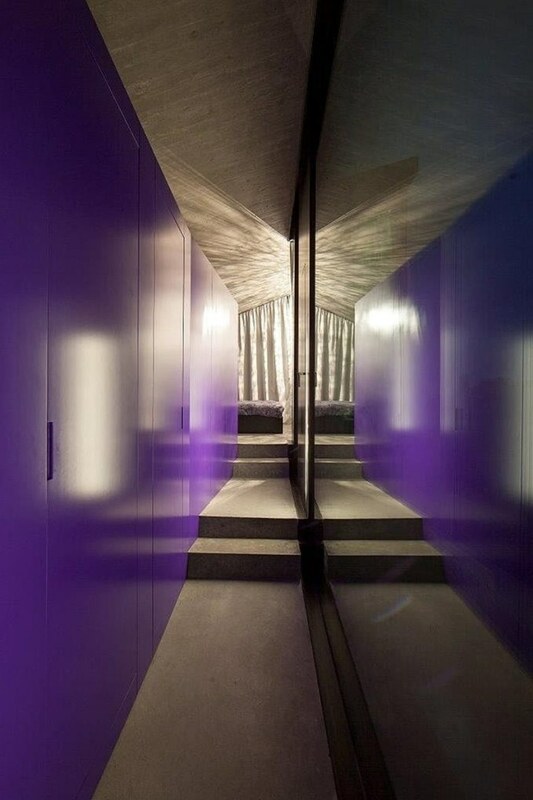 In addition, to divide the room helps thoughtful lighting – each zone has its own source of light, decorated in different styles. 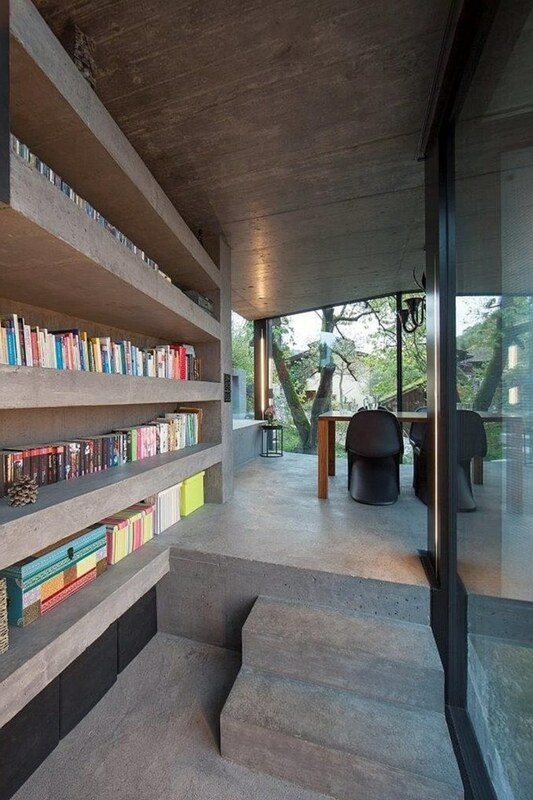 Grayness of concrete is simultaneously diluted and emphasized with bright spots. 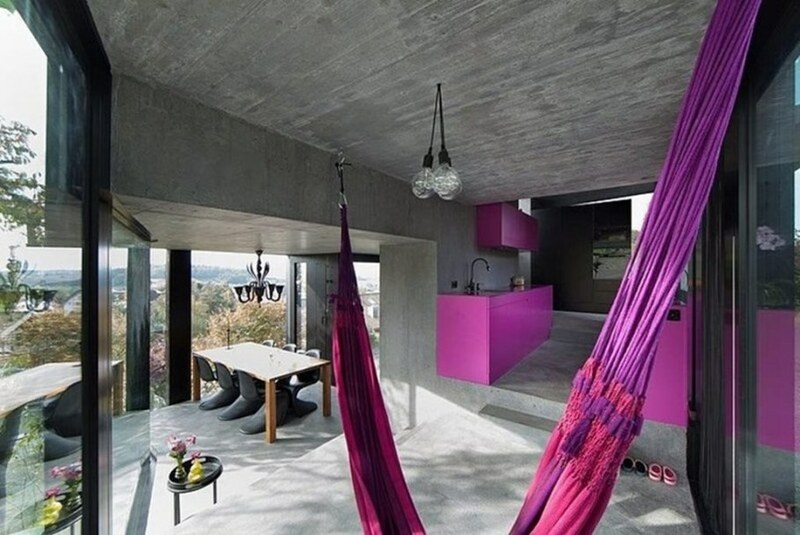 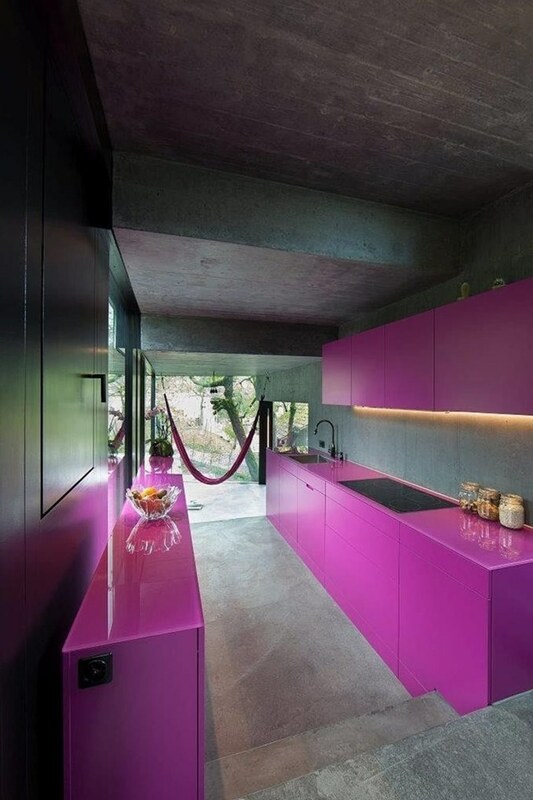 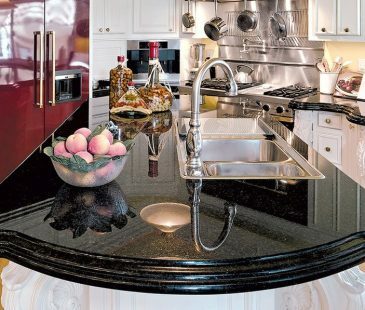 Purple kitchen furniture raises the spirits and creates a festive atmosphere. 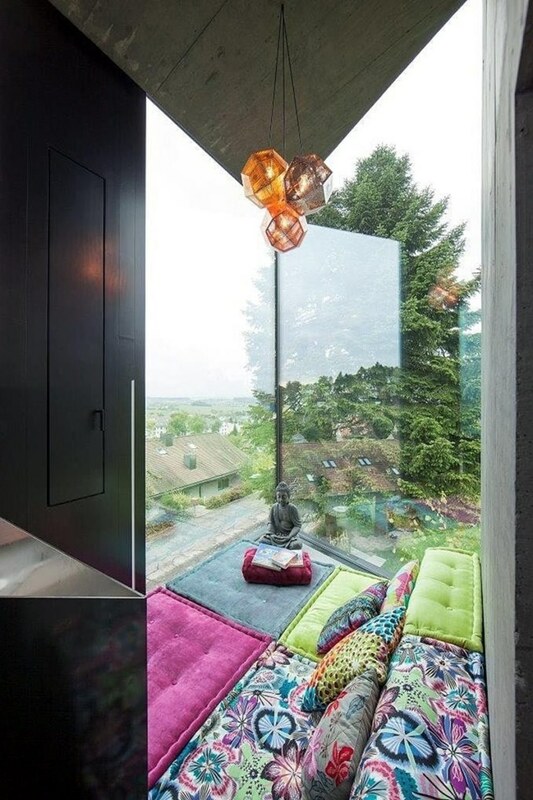 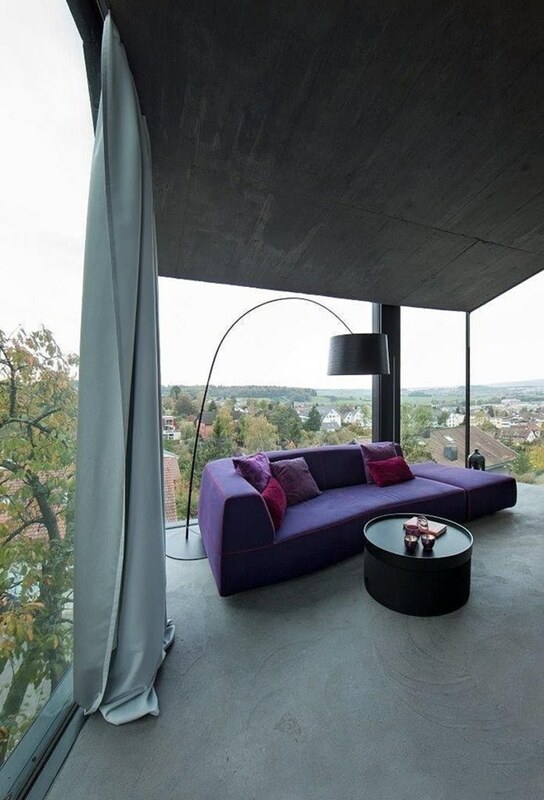 In the living room, sofa cushions of cheerful colors neutralize boredom, and in the sitting area there is a bright sofa at the window, where having a rest you can admire by the surroundings. 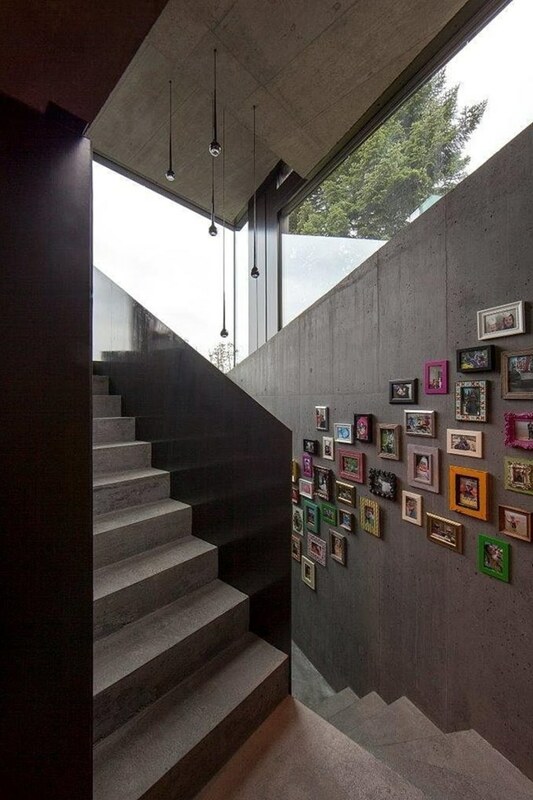 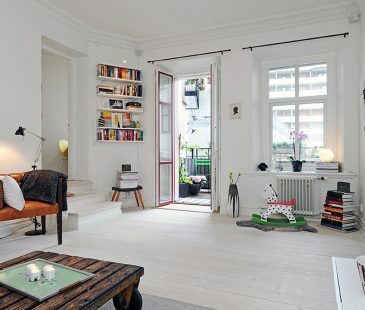 To the second floor leads a wide concrete staircase, its wall is decorated with family photos in colorful frames. 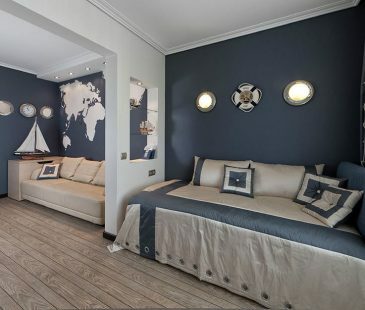 On the second floor there is a spacious and bright bedroom, combined with a bathroom and a small dressing room. 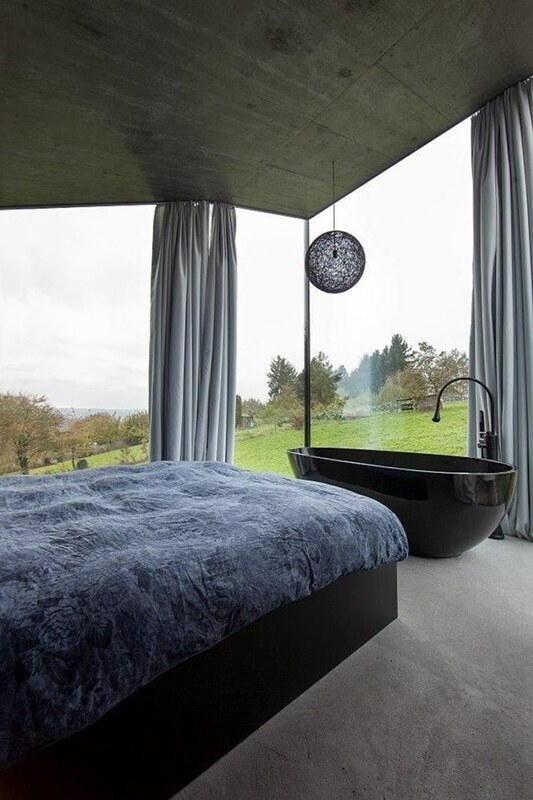 A stylish gloss black bathtub is situated right near the bed at the large window, giving the owners an opportunity to enjoy water procedures, admiring the scenery. 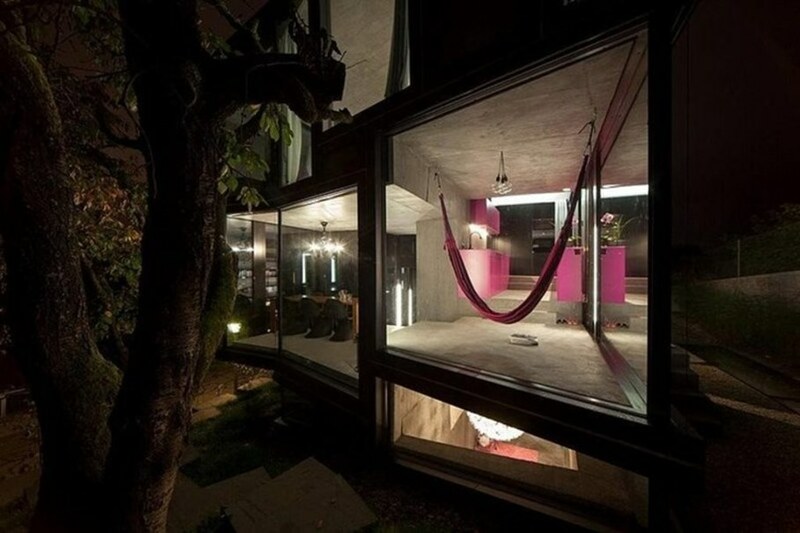 Overnight you can close windows from curious neighbors with the blackout curtains, and lamps – cobwebs decorate the walls and shelves with unusual traceries, in which everyone sees what the imagination draws to him.